Hi there! Today’s post deals with the fate of an asteroid family. You remember Datura? Now you have Hungaria! Datura is a very young family (< 500 kyr), now you have a very old one, i.e. probably more than 1 Gyr, and you will see that such a long time leaves room for many uncertainties… The paper I present is entitled Planetary chaos and the (In)stability of Hungaria asteroids, by Matija Ćuk and David Nesvorný, it has recently been accepted for publication in Icarus. Usually an asteroid family is a cluster of asteroids in the space of the orbital elements (semimajor axis, eccentricity, inclination), which share, or a supposed to share, a common origin. This suggests that they would originate from the same large body, which would have been destroyed by a collision, its fragments then constituting an asteroid family. Identifying an asteroid family is not an easy task, because once you have identified a cluster, then you must make sure that the asteroids share common physical properties, i.e. composition. You can get this information from spectroscopy, i.e. in comparing their magnitudes in different wavelengths. 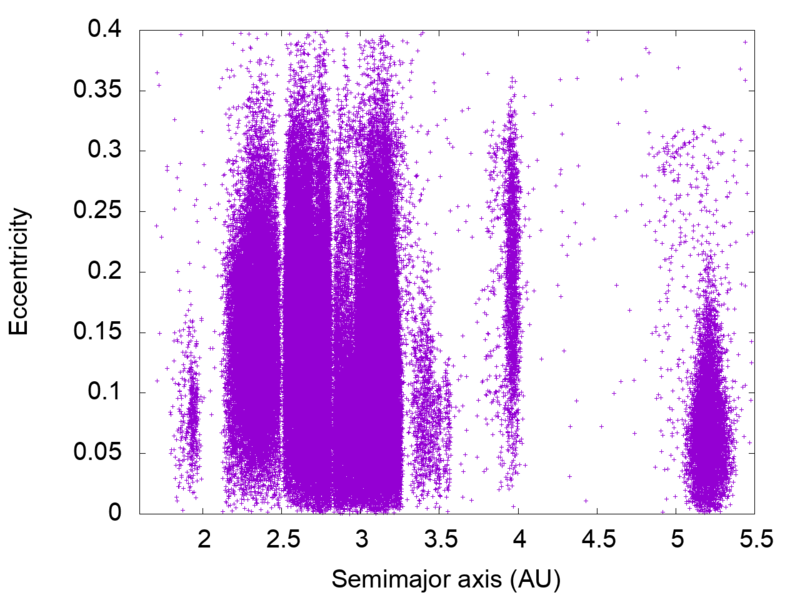 The following plot gives the semimajor axis / eccentricity repartition of the asteroids in the inner Solar System, with a magnitude smaller than 15.5. We can clearly see gaps and clusters. Remember that the Earth is at 1 UA, Mars at 1.5 UA, and Jupiter at 5.2. The group of asteroids sharing the orbit of Jupiter constitute the Trojan population. Hungaria is the one on the left, between 1.8 and 2 AU, named after the asteroid 434 Hungaria. The gap at its right corresponds to the 4:1 mean-motion resonance with Jupiter. 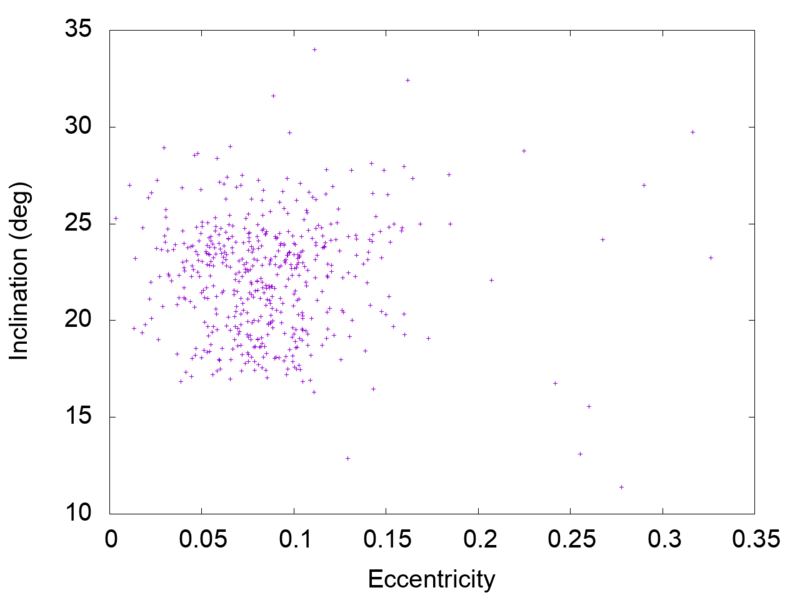 If we look closer at the orbital elements of this Hungaria population, we also see a clustering on the eccentricity / inclination plot (just below). This prompted Anne Lemaître (University of Namur, Belgium) to suggest in 1994 that Hungaria constituted an asteroid family. At that time, only 26 of these bodies were identified. We now know more than 4,000 of them. The origin of this family can be questioned. The point is that these asteroids have different compositions, which would mean that they do not all come from the same body. In other words, only some of them constitute a family. Several dynamics studies, including the one I present today, have been conducted, which suggest that these bodies are very old (> 1 Gyr), and that their orbits might be pretty unstable over Gyrs… which suggests that it is currently emptying. What is the origin of the original Hungaria population? What is the fate of these bodies? Beside the possible collisional origin, which is not satisfying for all of these bodies since they do not share the same composition, it has been proposed that they are the remnants of the E-Belt, which in some models of formation of the Solar System was a large population of asteroid, which have essentially been destabilized. Another possibility could be that asteroids might pass by and eventually be trapped in this zone, feeding the population. Regarding the fate, the leaving asteroids could hit other bodies, or become Trojan of Jupiter, or… who knows? Many options seem possible. The difficulty of giving a simple answer to these questions comes partly from the fact that these bodies have a chaotic dynamics… but what does that mean? Chaos is a pretty complicated mathematical and physical notion, which has several definitions. A popular one is made by the American mathematician Robert L. Devaney, who said that a system is chaotic if it has sensitive dependence on initial conditions, it is topologically transitive (for any two open sets, some points from one set will eventually hit the other set), and its periodic orbits form a dense set. Let us make things a little simpler: in celestial mechanics, you assume to have chaos when you are sensitive to the initial conditions, i.e. if you try to simulate the motion of an object with a given uncertainty on its initial conditions, the uncertainties on its future will grow exponentially, making predictions impossible beyond a certain time, which is related to the Lyapunov time. But to be rigorous, this is the definition of hyperbolicity, not of chaos… but never mind. A chaotic orbit is often thought to be unstable. This is sometimes true, especially if the eccentricity of your object becomes large… but this is not always the same. Contrarily, you can have stable chaos, in which you know that your object is not lost, it is in a given bounded zone… but you cannot be more accurate than that. Chaos can also be related to the KAM theory (for Kolmogorov-Arnold-Moser), which says that when you are chaotic, you have no tores in the dynamics, i.e. periodic orbits. When your orbit is periodic, its orbital frequency is constant. If this frequency varies, then you can suspect chaos… but this is actually frequency diffusion. And now, since I have confused you enough with the theory, comes another question: what is responsible for chaos? The gravitational action of the other bodies, of course! But this is not a satisfying answer, since a gravitational system is not always chaotic. There are actually many configurations in which a gravitational system could be chaotic. An obvious one is when you have a close encounter with a massive object. An other one is when your object is under the influence of several overlapping mean-motion resonances (Chirikov criterion). This study is related to the chaos induced by the gravitational action of Mars. Mars orbits the Sun in 687 days (1.88 year), with an inclination of 1.85° with respect to the ecliptic (the orbit of the Earth), and an eccentricity of 0.0934. This is a pretty large number, which means that the distance Mars – Sun experiences some high amplitude variations. All this is valid for now. But since the Hungaria asteroids are thought to be present for more than 1 Gyr, a study of their dynamics should consider the variations of the orbit of Mars over such a very long time-span. And this is actually a problem, since the chaos in the inner Solar System prevents you from being accurate enough over such a duration. Recent backward numerical simulations of the orbits of the planets of the Solar System by J. Laskar (Paris Observatory), in which many close initial conditions were considered, led to a statistical description of the past eccentricity of Mars. Some 500 Myr ago, the eccentricity of Mars was most probably close to the current one, but it could also have been close to 0, or close to 0.15… actually it could have taken any number between 0 and 0.15. The uncertainty on the past eccentricity of Mars leads uncertainty on the past orbital behavior of Solar System objects, including the stability of asteroids. At least two destabilizing processes should be considered: possible close encounters with Mars, and resonances. Among the resonances likely to destabilize the asteroids over the long term are the gi (i between 1 and 10) and the fj modes. These are secular resonances, i.e. involving the pericentres (g-modes) and the nodes (f-modes) of the planets, the g-modes being doped by the eccentricities, and the f-modes by the inclinations. These modes were originally derived by Brouwer and van Woerkom in 1950, from a secular theory of the eight planets of the Solar System, Pluto having been neglected at that time. The eccentricity of Mars particularly affects the g4 mode. This paper consists of numerical integrations of clones of known asteroids in the Hungaria region. By clones I mean that the motion of each asteroid is simulated several times (21 in this study), with slightly different initial conditions, over 1 Gyr. The authors wanted in particular to test the effect of the uncertainty on the past eccentricity of Mars. For that, they considered two cases: HIGH and LOW. And the conclusion is this: in the HIGH case, i.e. past high eccentricity of Mars (up to 0.142), less asteroids survive, but only if they experienced close encounters with Mars. In other words, no effect of the secular resonance was detected. This somehow contradicts previous studies, which concluded that the Hungaria population is currently decaying. An explanation for that is that in such phenomena, you often have a remaining tail of stable objects. And it seems make sense to suppose that the currently present objects are this tail, so they are the most stable objects of the original population. Anyway, this study adds conclusions to previous ones, without unveiling the origin of the Hungaria population. It is pretty frustrating to have no definitive conclusion, but we must keep in mind that we cannot be accurate over 1 Gyr, and that there are several competing models of the evolution of the primordial Solar System, which do not affect the asteroid population in the same way. So, we must admit that we will not know everything. The web page of Matija Ćuk. The web page of David Nesvorný. The paper by Anne Lemaître, suggesting the existence of the Hungaria family. That’s all for today! Please do not forget to comment. You can also subscribe to the RSS feed, and follow me on Twitter and Facebook. Hi there! Today’s post deals with an asteroid family, more precisely the Datura family. The related study is New members of Datura family, by A. Rosaev and E. Plávalová, it has recently been accepted for publication in Planetary and Space Science. The Datura family is a pretty recent one, with only 7 known members when that study started. The authors suggest that 3 other bodies are also members of this family. Detailing the dynamics of asteroids would require more than a classical post, here I just aim at giving a few hints. Mean motion resonances (MMR) with planets, especially Jupiter. These resonances can excite the eccentricities of the asteroids until ejecting them, creating gaps known as Kirkwood gaps. At these locations, there are much less asteroids than nearby. Stable chaos. Basically, a chaotic dynamics means that you cannot predict the orbit at a given accuracy over more than a given timespan, because the orbit is too sensitive to uncertainties on its initial conditions, i.e. initial location and velocity of the asteroid. Sometimes chaos is associated with instability, and the asteroid is ejected. But not always. Stable chaos means that the asteroid is confined in a given zone. You cannot know accurately where the asteroid will be at a given time, but you know that it will be in this zone. Such a phenomenon can be due to the overlap of two mean-motion resonances (Chirikov’s criterion). Anyway, when an asteroid will or will not be under the influence of such an effect, it will strongly be under the influence of the planets, especially the largest ones. This is why it is more significant to describe their dynamics with proper elements. Usually, an elliptical orbit is described with orbital elements, which are the semimajor axis a, the eccentricity e, the ascending node Ω, the pericentre ω, the inclination I, and the mean longitude λ. Other quantities can be used, like the mean motion n, which is the orbital frequency. Because of the large influence of the major planets, these elements present quasiperiodic variations, i.e. sums of periodic (sinusoidal) oscillations. Since it is more significant to give one number, the oscillations which are due to the gravitational perturbers are removed, yielding mean elements, called proper elements. These proper elements are convenient to characterize the dynamics of asteroids. Most of the asteroids are thought to result from the disruption (for instance because of a collision) of a pretty large body. The ejecta resulting from this disruption form a family, they share common properties, regarding their orbital dynamics and their composition. A way to guess the membership of an asteroid to a family is to compare its proper elements with others’. This guess can then be enforced by numerical simulations of the orbital motion of these bodies over the ages. Usually a family is named from its largest member. In 2015, 122 confirmed families and 19 candidates were identified (source: Nesvorný et al. in Asteroids IV, The University of Arizona Press, 2015). Many of these families are very old, i.e. more than 1 Gyr, which complicates their identification in the sense that their orbital elements are more likely to have scattered. The Datura family is thought to be very young, i.e. some 500 kyr old. A funny memory: in 2005 David Nesvorný received the Urey Prize of the Division of Planetary Sciences of the American Astronomical Society. This prize was given to him at the annual meeting of the Division, that year in Cambridge, UK. He then gave a lecture on the asteroid families, and presented the “Nesvorný family”, i.e. his father, his wife, and so on. The asteroid (1270) Datura has been discovered in 1930. It orbits the Sun in 3.34 years, and has a semimajor axis of 2.23 AU. As such, it is a member of the inner Main Belt. Its orbit is highly elongated, between 1.77 and 2.70 AU, with an orbital eccentricity of 0.209. It rotates very fast, i.e. in 3.4 hours. Its diameter is about 8.2 km. It is an S-type asteroid, i.e. it is mainly composed of iron- and magnesium-silicates. After having identified 10 potential family members from their proper elements, the authors ran backward numerical simulations of them, cloning each asteroid 10 times to account for the uncertainties on their locations. The simulations were ran over 800 kyr, the family being supposed to be younger than that. The simulations first included the 8 planets of the Solar System, and Pluto. The numerical tool is a famous code, Mercury, by John Chambers. The 10 asteroids identified by the authors include the 7 already known ones, and 3 new ones: (338309) 2002 VR17, 2002 RH291, and 2014 OE206. These are all sub-kilometric bodies. The authors point out that these bodies share a linear correlation between their node and their pericentre. This study also shows that 2014 OE206 has a chaotic resonant orbit, because of the proximity of the 9:16 MMR with Mars. This resonance also affects 2001 VN36, but this was known before (Nesvorný et al., 2006). The authors also find that this chaotic dynamics can be significantly enhanced by the gravitational perturbations of Ceres and Vesta. Finally, they say that close encounters might happen between (1270) Datura and two of its members: 2003 SQ168 and 2001 VN36. Now, to be honest, I must mention another study, The young Datura asteroid family: Spins, shapes, and population estimate, by David Vokrouhlický et al., which was published in Astronomy and Astrophysics in February 2017. That study goes further, in considering the 3 new family members found by Rosaev and Plávalová, and in including other ones, updating the Datura family to 17 members. This seems to be a kind of anachronism: how could a study be followed by another one, which is published before? In fact, Rosaev and Plávalová announced their results during a conference in 2015, this is why they could be cited by Vokrouhlický et al. Of course, their study should have been published earlier. Those things happen. I do not know the specific case of this study, but sometimes this can be due to a delayed reviewing process, another possibility could be that the authors did not manage to finish the paper earlier… Something that can be noticed is that the study by Vokrouhlický is signed by a team of 13 authors, which is expected to be more efficient than a team of two. But the very truth is that I do not know why they published before. This is anyway awkward. By the way, 2003 SQ168 is the asteroid, which has the closest semimajor axis to the one of (1270) Datura, in Rosaev and Plávalová’s paper. Now, when I look at Vokrouhlický et al.’s paper, I see that 2013 ST71 has an even closer semimajor axis. I am then tempted to speculate that these two very small bodies are coorbital to (1270) Datura. Maybe a young family favors such a configuration, which would become unstable over millions of years… Speculation, not fact. This is actually not an horsehoe orbit. The large variation of the distance is due to the fact that 2003 SQ168 is on a orbit, which is close to the one of (1270) Datura, with a slightly different orbital frequency. Regarding 2013 ST71, a numerical simulation by myself suggests the possibility of a temporary (i.e. unstable) capture in a 1:1 MMR. The study, made freely available by the authors on arXiv, thanks to them for sharing! You can also find a preliminary communication here. The study by Vokrouhlický et al. The profile of Alexey Rosaev on ResearchGate. The profile of Eva Plávalová on ResearchGate. The asteroid families, compiled by David Nesvorný.